Dastardly and bastardly literary legend Lord Byron is back from the dead with something to prove. More wham, bam and glam than ever before, the reinvented Lord Bi-ron must first help Nathan with his English assignment. 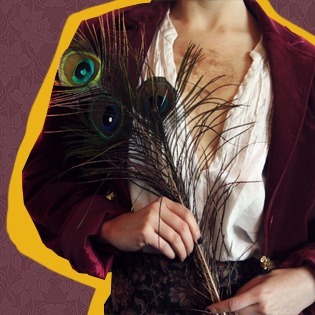 It’s been a long 195-year hiatus for the Romantic poet, but struggling uni student Nathan may have just instigated a second wave for Lord Bi-ron: A bi-centennial comeback and an unlikely friendship prompted by a call for help with ENGL114. Lord Bi-Ron: Mad, Bad & Dangerous is the very first full-length treat to drag ghostwriter Lord Bi-ron, played by Wellington’s most affable chap Aimee Smith (Deep South Caesar, M’Lady) and with original live music by Isaac Thomas (Deep South Caesar, Satisfied Customers, PlayShop). The award-winning duo (Best Ensemble, Nelson Fringe 2018) are together again under direction from James Cain (Under, Richard II) for double the trouble and double the entendre. Glamour and glitz, sequins and quips! Classic literature like you have never even thought about it before! Mad Bad & Dangerous is everything you could ever want from Fringe in one show: Comedy, music, glitter, drag, séance, and intersectional feminist discourse.